The TGI MM TFC015I Membrane is a Thin Film TFC Inline membrane for use with the TGI 415 Reverse Osmosis Water Filter. Capacity: This membrane will be efficient for a period of 2 years. Case Quantity: 25, Buy multiple and save! The TGI 3-stage RO Systems Provide universal application, and can be used with both chlorinated or non-chlorinated water. Choose either the TFC membrane unit for non-chlorinated water, or select the CTA membrane unit (for less) to allow contact with chlorine in the water. NSF certification on the TFC membrane unit, system tested and certified to ANSI/NSF standard 58. Shipping Dimensions: 17'' L x 17'' W x 18'' H, Weight 22 lb. 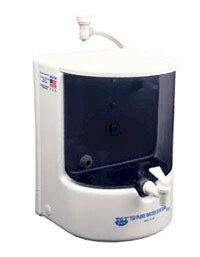 The TGI-325E 3-stage RO Systems Provide universal application, and can be used with non-chlorinated water. 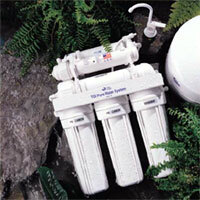 Unit includes a Permeate Pump, a great breakthrough in Reverse Osmosis System Technology. Designed to operate as a non-electrical energy recovery device, the Permeate Pump uses the available energy from the brine (waste water out of the RO Unit) water after the flow restrictor to essentially force purified water into the RO Storage Tank. The permeate Pump eliminates the need for hydraulic shut-off valves and can be used for replacing booster pumps in well water applications. The Permeate Pump advanced technology is capable of bringing the tank up to incoming water pressure and shutting the RO System down when the Storage Tank reaches full capacity. This unit is a NSF tested and certified system to ANSI/NSF standard 58. Shipping Dimensions: 20'' L x 17'' W x 20'' H, Weight 27 lb. 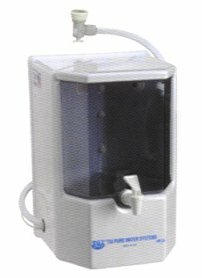 The TGI-415 4 stage RO Systems utilize a highly advanced TFC membrane process that provides a consistently better-tasting supply of water. NSF certified. System tested and certified to ANSI/NSF standard 58. Heavy Duty Aluminum with Powder Coating White Bracket, all Stainless Steel Mounting Screws. Automatic Shut-off Valve, Flow Restrictor. Stainless Steel Check Valve with John Guest Quick Connect. Long Reach Chrome Faucet (Non Air Gap) Assembly with John Guest Quick Connect. Opella Self Piercing Saddle Valve with Quick Connect Assembly. White Amtrol RO-4 Pressure Tank (4 Gallon Tank Volume) with Tank Ball Valve Assembly. All John Guest Quick Connect Fittings for Saving as much as 40% of Installation Time. Shipping Dimensions: 17'' L x 17'' W x 18'' H, Weight 24 lb. The TGI-525 5 stage RO Systems combine the most advanced Reverse Osmosis and Extruded Carbon Filtration technologies today. WQA Gold Seal. Tested and certified to remove/reduce TDS, Barium, Cadmium, Copper, Hexavalent and Trivalent Chromium, Lead, Radium 226/228, Selenium Cyst amongst other contaminates. Choose either with or without a Booster Pump and ASV, Non Electrical Automatic Shut Off valve. (even there's a power shortage, the system will still shut off automaticaly to save water. With Pump and ASV: 20'' L x 17'' W x 20'' H, Weight 35 lb. Without Pump and ASV: 17'' L x 17'' W x 18'' H, Weight 27 lb. 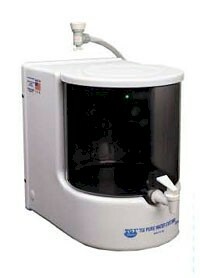 The TGI-625 6 stage RO/UV Systems are the most complete water treatment process. First they combine the most advanced Reverse Osmosis and Extruded Carbon Filtration technologies available today, and the add-on UV Ultra Violet system maximizes the performance. 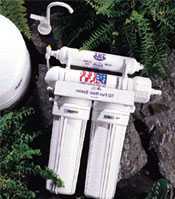 Available: Optional faucet monitor that continuously checks membrane effectiveness. NSF certified. System parts tested and certified to ANSI/NSF standard 58.
with or without a Booster Pump and Electronic Shut Off valve. Comes with faucet and 4 Gallon Tank. #625U, RO+UV 1GPM: 17'' L x 17'' W x 18'' H, Weight 30 lb. #625U/DX, RO+UV 2 GPM SS: 17'' L x 17'' W x 18'' H, Weight 32 lb. #625UP, RO+UV 1GPM With Pump and ESO: 20'' L x 17'' W x 20'' H, Weight 37 lb. 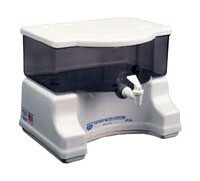 #625UP/DX, RO+UV 2 GPM SS With Pump and ESO: 20'' L x 17'' W x 20'' H, Weight 39 lb. Tank level control (TLC) for automatic shut off of the system. Ideal for homes with low water pressure (below 60 psi / 4 bar) Get the 425P - same unit with Pressure Pump! Ideal for homes or offices with low water pressure (below 60 psi /4 bar). Ideal for homes with low water pressure (below 60 psi / 4 bar), Unit comes with Pressure Pump! Ideal for homes with low water pressure (below 60 psi / 4 bar) Get the CT-445P - same unit with Pressure Pump! The TGI FI SED1005 Filter Replacement Cartridge is a 5 micron 10 inch Polypropylene Sediment Filter, for use with the TGI... 415; 550; 625U; 625U/DX; 525P; 550P; 625UP/DX; 30U; 30U/DX; 40U; 40UDLX - amongst other units. 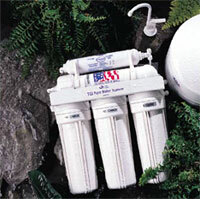 Capacity: This sediment filter is efficient for a period of 6 months. Case Quantity: 40, Buy multiple and save! The TGI FI CTO010 Filter Replacement Cartridge is a CTO/2 10 inch Carbon Block Filter, for use with the TGI... 415; 550; 625U; 625U/DX; 325E; 525P; 550P; 625UP/DX; 30U; 30U/DX; 40U; 40UDLX - amongst other units. 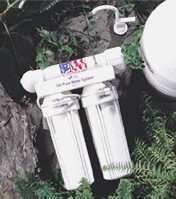 Capacity: This carbon filter is efficient for a period of 6 months to 1 year depending on your water filtration system. Case Quantity: 20, Buy multiple and save! The TGI FI CBA010 Filter Replacement Cartridge is a Granular Activated Carbon Filter, 10 inch Inline GAC Filter, for use with the TGI... 415; 525P; 550UP [two of these on this system]; POU-40UH; POU-40UHY; POU-425; POU-425Y; POU-425H; POU-425HY - amongst other units.